This is one of the most subtle of ombre hairstyles, and it actually works really well – so if you fancy buying into the ombre trend but don’t want to overdo it, this could be ideal choice for your hair. Here, Emily Blunt’s shoulder length brown hair is lifted and given a modern twist by a subtle golden brown shade at the ends. This is so well done that you cannot discern where the lighter colour starts – it is perfectly graduated for a more subtle look. The result is that the detail gives a simple straight style a real touch of contemporary styling. With Emily Blunt’s pale skin tone and cool blue eyes, you might be surprised to notice how well she wears a darker hair colour. Defined eyes and brows help to unify the look, and a really great hairstyle makes the glossy dark brown colour really work for her. 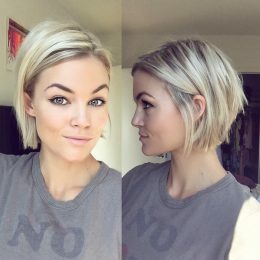 This might look like a simple bob but it has been cleverly shaped with slightly shorter layers throughout and the ends have been razor cut for a softer yet more contemporary look. The hair itself is straight but shaped in a gentle curve to frame the face and flatter the jawline. This is a very easy, relaxed way to wear a medium length hairstyle. 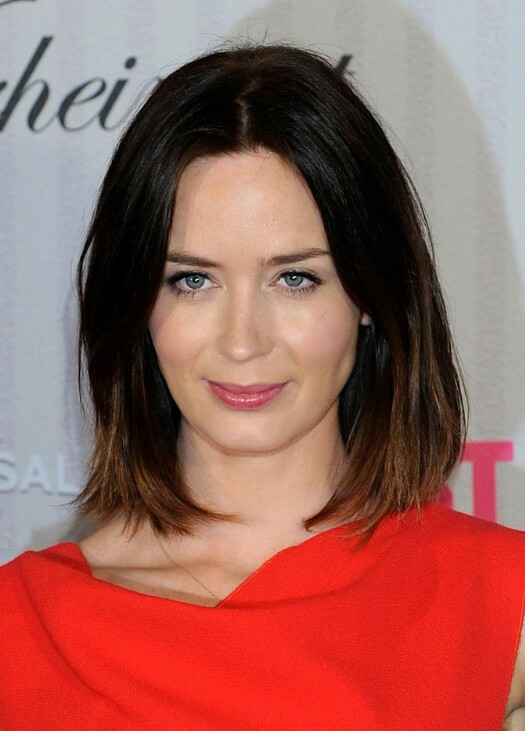 Here, Emily Blunt’s fair hair is cut to shoulder length and given shape with a few subtle layers. She wears it in a slightly side parting that looks natural and then the lengths fall softly onto the shoulders in a very loose gentle waves. 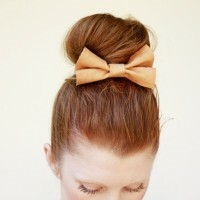 The result is a feminine, soft style that looks so natural and relaxed. Brighter blonde tones along the lengths add a sunny, summery look to this casual style. A simple natural looking parting set slightly to the side allows the lengths of Emily Blunt’s shoulder length hair to fall naturally in very loose, tousled waves. This is a very casual look for Emily and the ombre style blonde colour towards the ends of the lengths give it a beachy, sun kissed look that is great for summer and autumnal styles. The overall effect of this easy to achieve look is one of natural feminine style – a very pretty look that really complements Emily Blunt’s pale skin tone. Emily Blunt’s elegant style is a great way to create an updo that is formal enough for the biggest occasions (this would look beautiful on a bride for her big day) and yet the loose strands and slightly messy finish makes it soft and easy to wear. A French braid captures all the hair and sweeps it around the side of the head, adding gorgeous feminine detail to the style. A few fine highlights throughout the warm auburn brown base colour makes this all the more pretty. Find more Emily Blunt and latest hairstyle for 2016 on our site.